PREMIUM 2 BR, 2 BA CONDO – SKI IN/SKI OUT – SLEEPS 6 This 2-bedroom, 2-bathroom premium ski-in/ski-out condo is a fantastic choice for families and groups up to 6. The location is perfect: You’re steps from the Snowflake Lift, and you can walk or catch the convenient shuttle bus to all the shops and restaurants on Breckenridge’s historic Main Street. Ski to the lift in the morning, ski in for lunch, and be back on the lift in minutes — it truly doesn’t get any better than this in Breckenridge! The cozy living area features vaulted ceilings, a gas fireplace, a large LCD TV w/Xbox, and plenty of seating for everyone to gather and relax. You can also step out onto the private patio to take in the trees, mountain stream, and brisk mountain air. The full kitchen features granite tile counters and all the appliances and cookware you’ll need to keep the troops happy and fed. The dining table seats six, and there’s room for three at the counter for breakfast and snacks. The Riverbend Lodge offers plenty of amenities too, including: large indoor and outdoor hot tubs; a dry sauna and steam room; an exercise room; private ski lockers on the ground floor; and indoor heated parking. 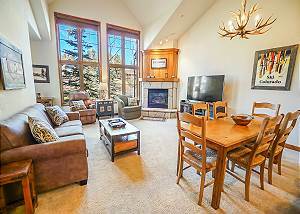 This charming condo is a true Breckenridge gem with ski-in/ski-out convenience, resort amenities and a great location close to downtown. Call us today to book the perfect mountain getaway at Riverbend 219! SLEEPS 6: MAIN LEVEL: - Master bedroom: king bed, LCD TV, bathroom with granite counters and tub/shower, private door to patio. - Bedroom 2: king bed, LCD TV. - Bathroom: Full bathroom with granite counters and tub/shower. - Living area: queen sleeper sofa. SPECIAL UNIT NOTES – PLEASE READ: - No Pets / No Smoking. - A $350 refundable damage deposit will be charged to credit card at check in. - Renters must be a minimum of 25 years old. - Parking: 1 garage parking space total. - No air conditioning. All units include at least one fan. - Business and Occupational License #396980001.